On Friday, October 12, over 200 people attended Creating Experiences, a gala in support of United Methodist Communities (UMC) at The Shores. The event raised $130,000 from live and silent actions, sponsors and gala admission. 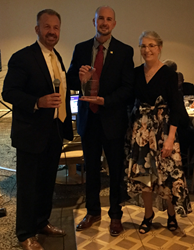 Frank Donato, III, Ocean City’s director of finance and OEM coordinator accepts recognition, flanked by UMC President and CEO, Larry Carlson (left) and Vice President of Operations, Carol McKinley. Tonight, we formally kick off our plans to improve the experiences of The Shores’ residents, as well as visitors from near and far. We are blessed to be a part of America’s Greatest Family Resort - Jessica Stewart, The Shores executive director. On Friday, October 12, over 200 people attended Creating Experiences, a gala in support of United Methodist Communities (UMC) at The Shores. Held at the Greate Bay Country Club in Somers Point, the event raised $130,000 from live and silent actions, sponsors and gala admission. The proceeds will support planned physical changes to The Shores and complements its goal to be Creating Experiences for not only their residents, but also for individuals and groups within the Ocean City community-at-large. The shared living and learning spaces include redesigned common areas and lobby, and new Community Lecture Hall and three dining areas. At a pre-gala VIP Reception, UMC President and CEO, Larry Carlson, acknowledged very generous contributions made by the Lead Sponsors: Sweetwater Construction Corporation, Presenting Sponsor; Hawks & Company, Entertainment Sponsor; Lockton, Beverage Sponsor, and Sodexo, Auction Sponsor. He also recognized Ocean City Mayor, Jay Gillian; Council President, Peter Madden; Business Manager, George Savistano; Chief of Police, Jay Prettyman; United Methodist Church of Greater NJ, Cape Atlantic District Superintendent, Rev. Brian Roberts; UMC Board of Trustees, Chair, Nona Ostrove; and UMC Foundation Board, Chair, Rev. Ed Carll. Emcee Rev. Marcia Stanford, pastor of the Macedonia United Methodist Church, welcomed and thanked guests and sponsors for coming. She shared a personal story about volunteering at The Shores and encounters with residents. Later, she delivered an invocation and blessing before dinner. The gala honoree, Frank Donato, III, serves as Ocean City’s director of finance and coordinator of the Office of Emergency Management. The Shores honored Donato for his commitment to ensuring community safety, maintaining open lines of communication, preparing and alerting residents of weather emergencies and evacuations. “Tonight, we formally kick off our plans to improve the experiences of The Shores’ residents, as well as visitors from near and far. We are blessed to be a part of America’s Greatest Family Resort,” stated Jessica Stewart, The Shores executive director and member of the Gala Steering Committee. Contributing Sponsors bolstered the fundraising: Atlantic Trust, PNC Bank, McCarter & English, The WIN Marketing Group, DataPro, ProviNet, Direct Supply, Image Revolver, Baker Tilly, Esposito, Kiker and Associates, Symbria, Merz, Ultimate Software, Provident Bank, PMA Companies, HJ Sims, RLA Thom Reichert, 1st Constitution, Masterpiece Marketing, Perkins Eastman, Onshift, Aetna, Insight, Central Jersey Insurance Associates, Expense Consulting, and McManimon Scotland Baumann. Johnson’s Popcorn, HDG Engineering Surveying Environmental, Fortress Financial, South Seaville Camp Meeting, Loveland Garrett & Batastini, AngelicHealth, and McMahon Insurance Agency stepped up as Local Sponsors. Following dinner, guests danced to music by Tim McCloone & The Atlantic Coast Band. As tokens of appreciation, guests took home complimentary containers of Johnson’s Popcorn and salted caramel truffles, courtesy of Shriver’s. For information on how you can support The Shores’ renovation project, please contact Susan Sharp, vice president philanthropy, United Methodist Communities Foundation, at 732-731-2122 or ssharp(at)umcommunities.org. The Shores is owned and operated by the United Methodist Communities which was established in April 1907 in Ocean Grove. With approximately 240 residents of all faith backgrounds, The Shores, a care continuum, offers Assisted Living, Tapestries Memory Care, Long Term Care, Short Term Rehabilitation, Respite and Hospice. The six-acre site has access to Ocean City’s beaches, boardwalk, Music Pier, Aquatic Center, and cultural activities in “America’s Greatest Family Resort.” For additional information about The Shores visit UMCommunities.org/TheShores or call 609-399-8505. United Methodist Communities is a not-for-profit organization guided by a volunteer board of directors affiliated in ministry with the United Methodist Church of Greater New Jersey. The mission of the United Methodist Communities is compassionately serving in community so that all are free to choose abundant life. With over 110 years of continuous operation, the organization has grown to nine communities offering affordable senior housing; independent, residential and assisted living; memory support; respite; rehabilitation; long-term care; and hospice and palliative care. In 2016, United Methodist Communities expanded its older adult services to include in-home personal care and case management through HomeWorks. For additional information call United Methodist Communities at 609-399-8505.